Our grandparents, Mildred and Paul Murata, are on the left in the photo, along with Paul’s parents, seated, and his two brothers. Bea’s Knees Farm is a family Kona coffee farm off the Mamalahoa Highway in Honalo, Hawaii, in the heart of the Kona districts. 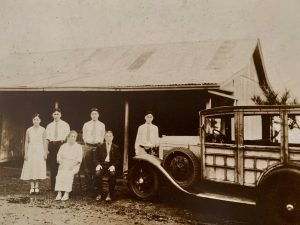 Our Nisei grandparents, Paul Toyohachi & Mildred Tsutae Murata, planted these Kona Typica trees (a variety of Arabica coffee) in the early 1930’s, and the family of eight supported themselves with the coffee farm. Their eldest daughter, Bea, is our mom. The expression “the bee’s knees” is an English slang phrase, meaning the best, the most desirable, the height of excellence. The farm name is a play on that expression and honors our mom, Bea, who strives for perfection. Our portion of the original farm is slightly over three acres in size, located at about 1400-feet in elevation. We can dry farm because of the perfect growing conditions for coffee — rich volcanic soil, sun, and rain. The uneven, rocky terrain requires most of the work to be done by hand. And the way coffee berries grow and ripen require multiple rounds of picking red coffee cherry by hand. All of the above gives our coffee its individual character. There are also a surprising number of variables and choices when selecting fruit and beans, processing coffee, storing beans prior to roasting, roasting, and brewing. It’s our pleasure to serve those who care about the source of their coffee beans and pay attention to all aspects of what goes into a truly good cup of coffee.